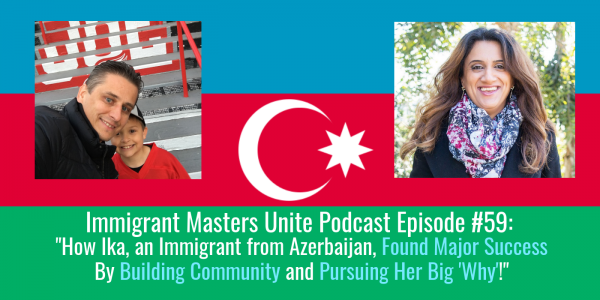 IMU 059: How Ika, an Immigrant from Azerbaijan, Found Major Success By Building Community and Pursuing Her Big 'Why'! | Immigrant Masters Unite Podcast: Transform Your Business, Life and The World Around You! Do you feel like you want to make a difference, but are lacking motivation? Do you feel like there’s something you’re missing from growing your business further? Do you feel like your challenges are your roadblocks? This is Polish Peter and welcome to episode 59 of Immigrant Masters Unite. Today, I have Ika Aliyeva from Azerbaijan. Aytakin (Ika) Aliyeva is a Forbes-featured Social Entrepreneur who founded Femigrants Foundation in March 2017, an online platform of more than 4000 diverse female immigrant entrepreneurs, small and medium-sized business owners, professional leaders working at top technology companies in the U.S. in STEM fields and micro and macro influencers. Using her advanced motivational skills, she encourages immigrant women to make positive changes in their lives and become successful women leaders in America. Ika’s inspirational story and her Femigrants Foundation has been published on several news media including Forbes, Business Women, Times of India, BBC Azerbaijan and others. Her dream is to build a powerful community of diverse immigrant women to help, support and empower each other to become influential women of America. How immigrant women are viewed in the society and how they can empower themselves to create powerful lives. Why it’s important to get around supportive and encouraging community. How social media can help you grow your business. In fact, that was one of the aspects that has helped Ika grow Femigrats organization to over 4,000 members. Top 3 reasons why Ika believes immigrants are so successful in United States and why their passions and challenges drive them to create great opportunities for themselves. Why it’s so important to have a big why driving you for success. Why you should embrace the challenges and circumstances to help you grow and become successful in life. How our immigrant perspectives can help us create a new businesses products or services.